I will state this baldly: when I cooked this recipe I was absolutely rancid with PMS. You know how when you feel bossed around by your hormones to the point where there is a part of yourself that exists outside your body watching all the insane things you say and do and says, ‘Why? Why did you do that? That was totally unreasonable and weird’? That was me. My boyfriend would ask me an innocuous question like ‘shall we take the dog for a walk?’ and my lip would quiver and I’d start lamenting the plight of stray dogs. Then he would get a succession of facial expressions that I’ve learnt to interpret. First there is the ‘OK, that was a radical interpretation of the text. Why is she crying?’ Then the ‘Oh wait, how long has it been since…hrm…’ [Quick mental calculation], and then the look of clarity, ‘Oh right, I bet it’ll happen in the next couple of days’. It’s a horrible thing we go through on a regular basis. It also manifests itself in a variety of inexplicable and not so inexplicable ways. Neutral statements become loaded with meaning, and managing to catch every single red light on the way to work becomes a source of diabolical rage. My own idiosyncrasies lead me to feel like the only way I’ll feel better is if I’m able to achieve or create something usual, even if it’s just paying some bills, cleaning the bathroom or cooking something tasty. I got into a state during my last cycle and decide I needed to channel my frustration into cooking something I’d never cooked before: meatballs. It was reasonably logical in my head – I would create something that provided sustenance and happiness and I would learn something new. I realise it’s a lot of meaning to attach to meatballs but hey, if it works then just go with it. This recipe I took and modified from the May 2013 edition of Super Food Ideas, a totally fantastic food mag. It has all the basics you need like which recipes have the greatest nutritional value, how many calories per serve, stats on cholesterol… It’s great. On a side note, apparently our iron levels drop when we menstruate, hence why many women crave meat! 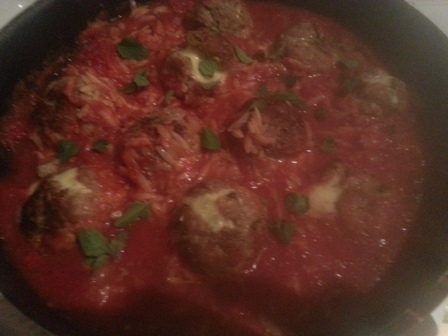 I imagine it’s probably better to consume lean meats during this time but oh my God these meatballs are delicious. I hope you enjoy them! Please note, you should allow 30 minutes of refrigeration time. Combine the garlic, mince, egg, breadcrumbs and herbs in a large mixing bowl. Mix thoroughly (the most effective way is with your hands). Take approximately ¼ cup of the mince mixture and roll into a ball. Flatten the ball in a disc. Cut a small piece of mozzarella and place in the middle of the disc then shape the mixture around it into a ball again. Repeat with the remaining mixture. You should get about eight to eleven balls (this is good to keep in mind when dividing up the cheese). Place on a plate and refrigerate for 30 minutes. Preheat oven to 190?C. Heat some olive oil in a large oven proof pan and cook the meatballs for about five minutes until they are browned all over. Transfer back to the plate. Heat another splash of olive oil and cook the onion over medium heat so as to soften but not colour. Add the stock and the tinned tomatoes and bring to the boil. Season with some salt and pepper and add the risoni and stir in well. Place in the oven and bake for 25 minutes. Serve with the extra oregano leaves sprinkled over the top. This entry was posted in Food and tagged a yummy substitute, food. Bookmark the permalink.